Pyllinux wanted to see the NASA Blue Marble Collection as monthly textures on his xplanetFX desktop. If you want to get an impression please take a look here. 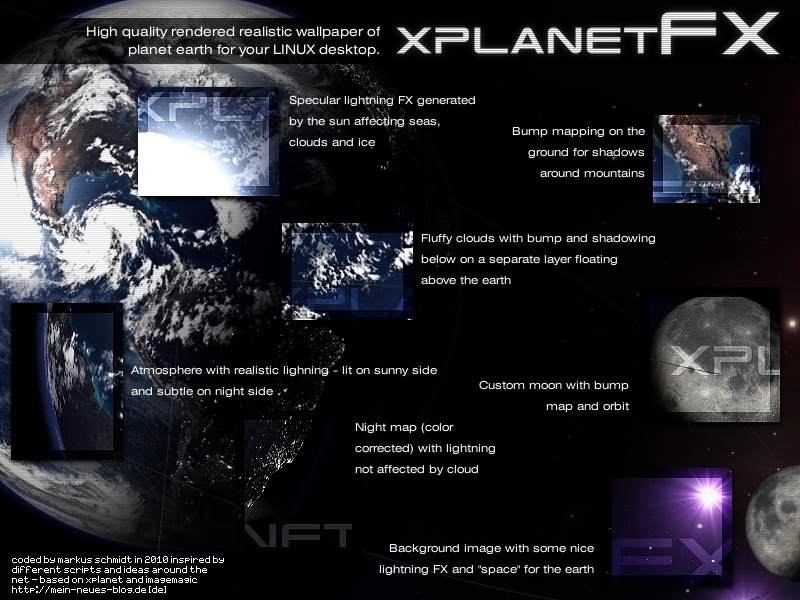 So here’s a script to set up everything needed to change xplanetFX’s textures to the NASA series. To see if the setup is downloading everything you may want to run it from a terminal once. After the first run a new hidden folder exists in your home directory called .NASA-blue-marble-collection. This one holds all of the downloaded files and some update information. The standard configuration also uses a new topography image and the NASA night map from the NASA (which can be disabled in the configuration section). Everytime the script runs it looks if you have installed a new template (or overwritten the earth texture in any other way) or if the month changed since the last update. If so, it takes the image for the actual month, resizes it to xplanetFX’s resolution and stores it in the right place to be used by xplanetFX. The same is done with topography and night map if you enabled them (default is on, leave empty if you don’t want to use them). The images aren’t taken from the NASA server (because it rejects download tries from scripts and blocks your IP for a couple of minutes afterwards) but from other servers found on the internet hosting this stuff. If they’re down search your fav search engine for the filenames (not the complete URL’s) from the configuration section. The files are downloaded once with the first run of the script. You may want to force a complete refresh, then use the option -r or –refresh to delete all files related to this thing and start all over (It will not destroy anything in xplanetFX but will remove its folder completely – so don’t place the script in .NASA-blue-marble-collection!). If you want to force the update of the textures use -f or –force to rewrite xplanetFX’s textures, no matter what the latest update information says. …do not hammer down the servers (with -r). There are enough problems with clouds images and stuff so we don’t need more problems with earth textures atm ,) and note: the images are of 2007 – there are no updates. So a simple one-time-setup per machine should be enough. This script was hacked in half an hour so there’s no guarantee at all ,) it was tested on Ubuntu 10.04 by now, please leave a short comment if you’re experiencing any problems or if you want to let the world know about a success on your particular system. Since version 2.3.0 this feature is permanently built into xplanetFX and can be used via GUI and CLI. This article was published Samstag,, 30. Juli 2011 @ 22:32. You may want to subscribe to the comments via RSS 2.0 feed. Post a comment, or create a trackback on your page. Thanks a lot Markus !!! It works fine on my Naty. great to hear that and thanks for the reply! great script… it works on my Ubuntu 10.04 (Lucid Lynx) – Gnome 2.30.2.
thank you for the info and your props! It works perfectly on 10.10 as well. Thank you for the indication and you’re welcome!